1. POCUS in isolation had good correlation with diagnosis determined by emergency physician for patients with undifferentiated dyspnea. 2. POCUS lead to decreased time to diagnosis although limitations to the comparison. 3. 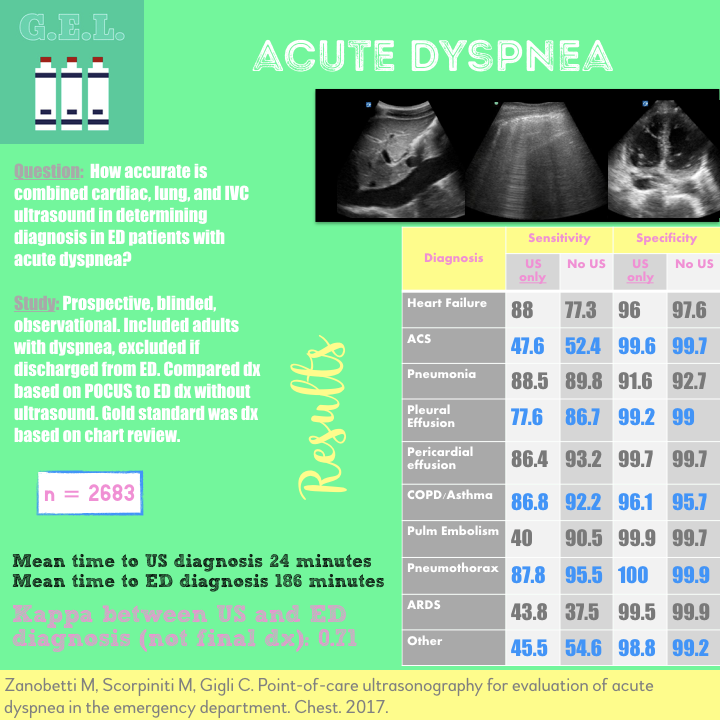 POCUS showed overall high specificity and lower sensitivities for etiologies of acute dyspnea in the emergency department. Dyspnea as a presenting complaint to the ED is so common it's not even funny. Point of care ultrasound can diagnose pulmonary edema, pneumothorax, pneumonia, pleural effusion, and pulmonary embolism by looking at the lungs. Then it can turn around and diagnosis right heart strain, global cardiac dysfunction, focal wall motion abnormalities, and pericardial fluid with echocardiography. Add in the IVC - and you probably have at least an idea of what is causing that patient's symptoms. This paper takes a look at how accurate POCUS is in these patients in the emergency department. How accurate is combined heart, lung, and IVC ultrasound in determining diagnosis in an undifferentiated dyspneic patient in the emergency department? Study sonographer blinded to tests (aside from history, exam, and ecg potentially) compared to treating physician (blinded to POCUS). Both had to determine diagnosis which was compared to gold standard final diagnosis as determined by two emergency medicine experts by chart and diagnostic review including POCUS and any inpatient testing. Calculated test characteristics of POCUS-informed diagnosis and compared to traditional ED work up. Kappa 0.8 was considered optimal in this study. The concordance was therefore optimal for heart failure, pericardial effusion, COPD/asthma, PTX. It was "good" for ACS, PNA, pleural effusion. 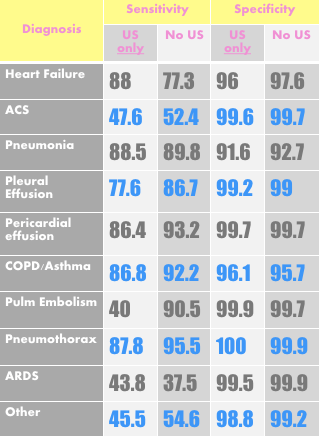 It was "moderate" for PE and "poor" for ARDS/ALI. My thought: who cares if it correlates with ED diagnosis if its not an accurate diagnosis? I think the authors were just trying to make a comparison to two diagnostic strategies here, but keep this in mind. This was not exactly a fair comparison - see limitations. 97% of the PE patients (n=40) had RV dilation, only 66% had “pulmonary infarction” on CT. No false positives with RV dilation but 3 cases (5% of PE) of false positives with subpleural consolidations (patients had subpleural consolidation but no PE). Main limitation is that this is not how you are supposed to use diagnostic POCUS. The whole point is that the person performing the ultrasound is also caring for the patient and is therefore able to use ultrasound information in conjunction with clinical and other diagnostic tests. 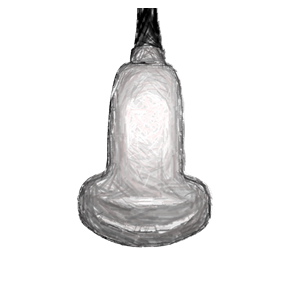 This study tests isolated ultrasound information (blinded to patient’s clinical information) and ED providers who were blinded to POCUS findings. Ideally, these are combined and therefore this study does not necessarily reflect conditions of clinical practice. A completely unblinded approach would have been more relevant information. If the POCUS clinicians had been able to see other diagnostics and response to treatment, they likely would have been more accurate than the EP diagnosis. It is unlikely that adding ultrasound would actually make your test characteristics worse (as it did in COPD and PE in this data). There could have been a POCUS first arm versus not POCUS arm to determine if there was decrease in other diagnostics and overall decreased time to admission (or other patient centered outcomes). Blinding not complete - could have influenced POCUS providers decision for diagnosis; on the other hand (as mentioned above), this more accurately represents the clinical use of POCUS. Excluded those discharged - probably because difficult to determine definitive diagnosis and the fact that they would be less likely to have most of the diagnoses assessed here. However, this is important in applying this data. Did not look for DVT - did not want exam to be too time consuming. This could have improved test characteristics for PE. Low prevalence of ARDS (n=16, 0.55%), can’t draw conclusions from this subset of the data. The time comparison was not really a fair comparison. The ultrasonologists only had to complete the study on a single patient and make a diagnosis to stop the clock. The emergency physicians in the study presumably had more patients and other duties to attend to prior to deciding on a diagnosis.